Frilled dragons (Chlamydosaurus kingii) are medium-size lizards from Australia and New Guinea. Named for the iconic neck frill with which they intimidate predators and rivals, frilled dragons are hardy lizards who thrive in captivity with the proper care. While not a good choice for a first pet lizard, they do not present any unusual maintenance challenges. If you provide an appropriate enclosure, furnish it properly, monitor the temperatures and provide the food and water correctly, success is just about guaranteed. Frilled dragons require spacious cages to allow for natural behaviors. While adult males should not be kept together, as they may fight and injure each other, you can housejuveniles, pairs or multiple females together if you provide enough space. A pair or two of hatchlings can live in a 10- or 20-gallon enclosure, but they grow quickly and will soon need a larger habitat. Most frilled dragons reach adult size in 12 to 24 months. Custom-built or commercially produced cages are preferable to aquariums. A suitable cage should have at least 8 to 12 square feet of space per pair of lizards, equivalent to an aquarium of 120 gallons or more. Frilled dragons are avid climbers, so offer as much height as you reasonably can; at the least, the cage should be 24 inches tall. A screened lid will be necessary for aquariums, which must often be custom-built for large sizes. In the wild, frilled dragons inhabit warm, seasonally dry forests, where they will move between patches of sun and shade to thermoregulate. You'll replicate this at home by providing a heat lamp at one end of the cage to create a thermal gradient between that end and the other. You'll use ordinary incandescent bulbs for the heat lamp, different from those you use for lighting. Use a thermometer to measure the temperatures of the cage. The hottest spot should be between 95 and 100 degrees Fahrenheit, and the cool end of the cage should be in the mid-70s. Begin with 100-watt bulbs, and adjust the wattage as necessary to achieve the proper temperatures. In exceptionally cool homes or buildings, you may need multiple heat lamps to achieve the desired temperature range. 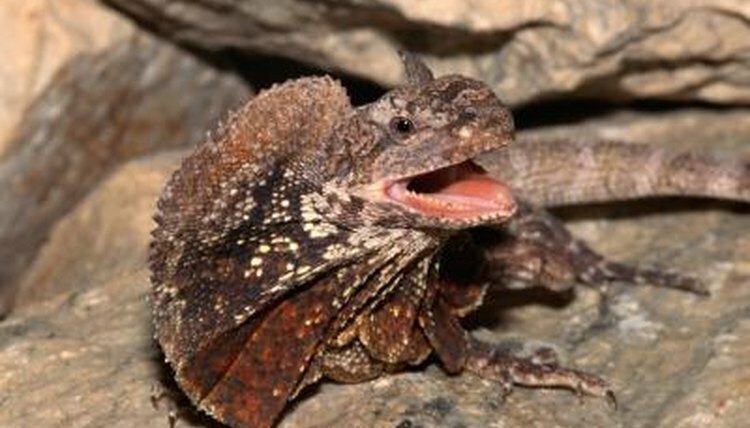 Diurnal lizards, like frilled dragons, require full-spectrum lighting, including the UVB portion of the spectrum, to metabolize their calcium properly. Additionally, exposure to UVA will encourage natural behaviors and help to prevent depression and anorexia. A variety of full-spectrum bulbs exist in the marketplace; look for models with 5 percent UVB levels. Your lizards need to get within 12 inches of the bulbs, so place them next to the heat lamps. These bulbs don't produce UVB indefinitely, so change them every six months to ensure a high level of UVB emission. Ensure that your lizards have a steady day-night cycle. Purchase and use a simple timer for all of the lights in the cage, and set them to be on for approximately 12 hours per day. While breeding adults may require manipulation of the day length, a standard 12-hour cycle suits juveniles and adults who aren't being used for breeding trials. Cage temperatures should not fall below 65 degrees at night; heat pads under the basking spot, or red or blue lamps can serve for night warmth. Large rocks under the heat lamp absorb and radiate heat after the lamp is off, which may alleviate the need for supplemental heat. Frilled dragons spend much of their time in the wild alternately clinging to vertical tree trunks and chasing insects on the ground. Strive to re-create this habitat by incorporating large, flat, wooden surfaces for the frilled dragons to cling to. Place several climbing structures under the heat lamp, creating several basking spots of slightly different temperatures, and place a few at the cool end of the enclosure. Corkbark, natural tree bark or branches can provide these perches. Frilled dragons are primarily insectivores, though some occasionally accept plant material. Frilled dragons should eat crickets, mealworms, silkworms and roaches throughout their lives. Incorporate as much variety as possible; some keepers elect to provide adults with occasional newborn mice, though this is not necessary. Frilled dragons should get about three dozen crickets daily, though occasional days without food are not a problem. Be sure to feed crickets that are no larger than the space between the lizard's eyes; you'll prevent impaction and other health problems. Frilled dragons need regular access to clean, fresh water, though they may rarely drink from it. Change the water daily, as the lizards may defecate in it or run through it, dragging dirt and bacteria into the water. Mist the dragons daily with lukewarm water, unless you are trying to cycle them for breeding purposes. During this time, many dragons will lap at the water droplets or be stimulated to drink from cage surfaces. Allow the habitat to dry out after misting. Avoid perpetually damp conditions. Can You Have a Bearded Lizard With Other Pets?